Journaling is an evidence-based approach proven to benefit both your physical and emotional health. When you write down your emotional experiences, you activate the right ventrolateral prefrontal cortex in the brain that helps to relax neural activity linked to strong emotional feelings. Not to mention, studies also offer that journaling is associated with improved outcomes for fighting diseases like asthma, rheumatoid arthritis, HIV/AIDS and cancer. Overall, putting pen to paper to reflect on the day in your own words helps both physical and emotional wounds heal faster. Here are seven equine-inspired journal templates to get you started on a reflective writing practice! The practice journaling is proven highly effective for managing stress and decreasing worry. By getting your anxieties out on paper, you stop your thoughts from endlessly ruminating in your head. Instead, when laid out in front you, it is possible to find alternative perspectives and ways to reframe the issue. Journaling also help you reflect on instances where you’ve already built resiliency and the strategies that allowed you to overcome. We are typically much harder on ourselves than we would ever be on our friends, so you may find it helpful to consider what support you may give a friend facing similar challenges. Here’s a Worry Template to guide you when stress begin to overwhelm you. Writing down your goals is key to achieving them. Research suggests those who vividly write their goals are up to 1.4 times more likely to successfully accomplish their goals. Check out this Goal-Setting Template to set a SMART (Specific, Measurable, Achievable, Relevant, and Time-bound) goal for yourself. By writing your goals, you tap into powerful neuroscience. Firstly, you are providing yourself with an external storage of the goal, where you may easily access and review your goal whenever you need. Furthermore, writing improves the encoding of your goal into your long-term memory so you continue to remember what you are working towards achieving. By engaging in a journaling practice, you learn more and better understand yourself and your patterns. Through your writing, you may raise your awareness for strategies you already have to relax and cope with stressors in your life. It also provides a reference for when you begin to feel overwhelmed, providing you with your own individualized sensory cues to find calm and ground yourself in triggering experiences. Take a moment to reflect before you feel stressed so you have a blueprint in a moment of need. This Relaxation Template provides a guide for you to start exploring the ways you personally find peace and tranquility. Planning for your future and making decisions is easier when you clarify your personal values. Everyone places emphasis on different aspects of life so take a moment to determine where you stand. Journaling helps you to increase awareness and reflect on the values you have that may influence your lifestyle decisions and actions. Establishing your values helps you make choices that align with and promote these individualized priorities. This Values Template provides you the opportunity to reflect on where you derive meaning for your values to be analyzed and clarified. Writing about the good parts of our lives provides vital perspective that allows us to feel greater happiness and less depression. According to research, a gratitude practice encourages us to feel more positive emotions, enjoy good experiences, improve our health, deal with adversity, and build strong relationships. Research suggests the sustained benefits of gratitude journaling stem from its ability to free us from toxic emotions like resentment and envy because you aren’t focusing on the negative aspects of your experience. Check out this Gratitude Template to get started on this valuable practice. Journaling helps us to solve problems better and shift ourselves into a more motivated stage of change. By writing, we engage our right brain into creativity and intuition for novel approaches to solutions, allowing our overused analytical, left brain to relax. In order to make important adjustments in our lives to promote growth, we first need to reflect and identify areas where we may shift. Then, we may set measurable goals to make those changes. Utilize this Change Template to begin targeting areas you want to see changes made to promote improved outcomes throughout your environment. Rooted in Buddhist tradition, the concept of loving-kindness meditations provides a valuable method for developing compassion. It helps us cultivate unconditional empathy for ourselves and those around us. In using the Loving Kindness Template, you will gain an open-hearted and non-judgemental presence so you may find compassion and acceptance for yourself and others. This template includes proven gratitude and strengths-based approaches to optimize your happiness and mental wellness. Let us know in the comments which templates you found most helpful in supporting your journaling practice. We’d also love to hear what other topics you’d like to have included in a future equine-inspired journal template. A session on the farm today transformed into an impromptu mindfulness session when we discovered the herd laying for an afternoon interlude in their paddocks. Not wanting to disturb their naps, we met our horse where he was today--utterly relaxed with his hooves tucked under him, eyes gently closed and trusting of his environment. We sat together in a circle with the snoozing horse and guided the client through a meditation, grounded in the natural, bucolic environment. Research continues to expand on the many benefits of engaging in a meditation practice (ie. increased empathy; decreased anxiety and depression; improved learning and memory) but, let’s be honest, it’s challenging to actually begin and even harder to sustain. For those bonded with horses, we’ve developed a few equine-specific approaches to help you explore mindfulness. Here are three equine techniques (no pony required!) to try as you delve into your next mindfulness practice, whether it’s taking a few minutes to focus on your breath or using a guided meditation on an app (Insight Timer, Calm, or Headspace). Thoughts will inevitably come as you try to be mindfully present and still. A key component to mindfulness is to avoid passing judgements on your thoughts as they come. As your thoughts emerge, transform them into a herd of horses galloping across your mind. Visualize the herd of thoughts entering from one side your mind and thundering across to exit on the other side. Notice the horses pass without judgment and refocus on your breath. One mindfulness researcher suggests, “Naming it to tame it.” This means that when you have a recurring, unhelpful thought and associated emotion arriving during your mindfulness sessions, label it. For example, if your thought is, “I need to get an A in all my classes,” label it as, “that’s the perfectionist story” or “here comes anxiety.” By naming it, you no longer allow yourself to be controlled by the emotion tied to the thought. Now, the equine approach to help support this is to assign a specific horse in your mind to a certain emotion when in a mindfulness session. So, when you anxiously think about an upcoming job interview, allow that thought to become the image of Muscateer, the bay Arabian that is always worried about new situations. By labelling the thoughts and feelings as specific horses, “Hey there, Muscateer!” you are also labelling those thoughts kindly since your empathy and compassion are likely far greater for your equine friends than yourself. Allow yourself to personalize these labels to horses within your own experience or archetypes of specific breeds. Quiet the mind during mindfulness sessions with grounding sensory imagery, returning to a moment on the farm when you were fully present. To achieve this, conjure the blending of shades you saw in the horse’s coat; then, recall the sensation you felt as your fingers grazed through the silky mane and onto the soft body; next, engage your memory of the sounds of hooves rhythmically clip-clopping across the ground at the trot; then, remember the smell of the horse fill your nose as you nestled into his neck. With your mind and body integrated by re-experiencing the sensory elements you noticed on the farm, you may resume breathwork to bring your awareness to now and progress in your mindfulness session. Feel free to apply these equine approaches individually or combine them to strengthen your mindfulness practice. We also encourage you to assimilate them into methods you have already found successful. In the comments, we welcome you to share how these approaches worked with your practice and any other tools you use already! 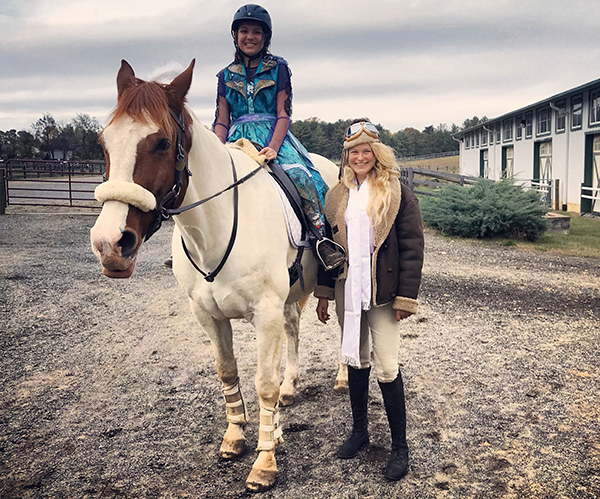 We are pleased to share that Elevation Equitation executive director, Erin Teigen, is now recognized as a Certified Equine Interaction Professional: Education (CEIP-E) through the Certification Board for Equine Interaction Professionals (CBEIP)! The CEIP-E credential indicates verification of extensive professional experience and independent assessment of knowledge in the field of equine interaction services. The certification is currently the highest level of competency assessment offered for equine interaction professionals in the U.S. and Canada. The CBEIP is recognized as an independent, not-for-profit certification organization, for equine interaction professionals in the fields of mental health and learning who seek voluntary, national certification. This comprehensive, Board certification acknowledges the professional identity, commitment, and knowledge of equine interaction professionals by endorsing safety and value for qualified educators, mental health counselors, psychotherapists, and equine colleagues. The CBEIP does not represent a specific method or approach to equine interaction work, and does not offer training. With this new designation, Erin demonstrates dedication to providing quality client services by having obtained education, training and supervision in equine interaction services. She is pleased to be included in a professional community interested in high standards and transparency in the equine interaction field to provide high-quality client services. Check back soon for updates to the Elevation Explores blog!